If you have a baby who is about to hit the wonderful milestone of moving around, or a tiny human who has just started crawling or a toddler who keeps you on your toes, reaching out to everything that is hazardous, we have the right accessory designed to make it a stress-free journey - secure cabinets, dresser, appliances or toilet away from those tiny hands. ORDER NOW & Get this Practical Combo of Child Safety Locks & Corner Guards Delivered to you in Just 1-3 Days! ✅ KEEP YOUR BABY SAFE - Do not hamper your little crawler's enthusiasm by constantly restricting them, instead keep all the dangers off with our simple yet highly effective baby safety lock that can easily lock away appliances, detergents or sharp tools so you can sit back and cherish their significant milestone! 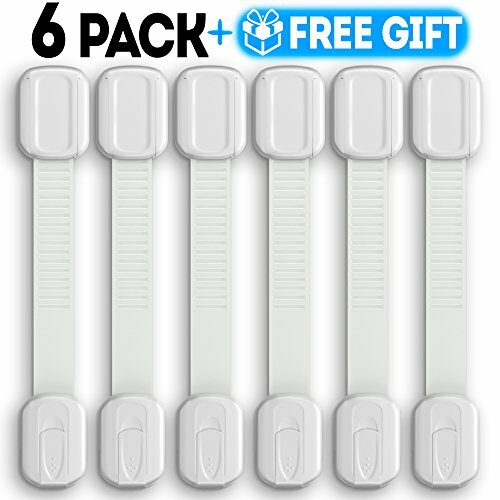 ✅ EASY INSTALLATION - Crafted with flexible PE foam strap, the size can be easily adjusted by cutting off the extra length, depending on where you want to stick them - no permanent alteration to cupboards or furniture required. Our user-friendly child safety lock makes latching and unlatching extremely easy for adults while it stays intact even with toddler's constant efforts to pull it off. ✅ STRONG 3M ADHESIVE - Made of good-quality plastic along with a firm 3M adherent, these cabinet safety locks can stick on wood or metal alike - the adhesive stays intact for years, at the same time can be removed easily without leaving any residue on the surface. Babies tend to grasp everything in their sight hence baby proof cabinets, oven, toilet, fridge, windows or dishwasher to keep your tiny explorer safe from any unforeseen accident. ✅ INCREDIBLE COMBO PACK - Our package includes 6 safe locks (19.5 cm long, 3.5 cm wide, 1.2 cm deep) and a FREE GIFT of 4 corner guards - a wonderful combination to stow away all the not-so-baby-friendly things as well as cover sharp corners. The sleek white latch with a semi-transparent strap & the transparent corner guards are designed to gel with any decor without hindering the aesthetics of your home. ✅ GUARANTEE - We also offer you 100% RISK-FREE SATISFACTION GUARANTEE on this childproof door lock or child safety latch; no questions asked. However, we are sure that you would fall in love with the practical design, efficiency and durability of these cabinet latches, that will keep your baby safe from harmful objects without requiring you to continuously monitor them. If you have any questions about this product by FamilyCare, contact us by completing and submitting the form below. If you are looking for a specif part number, please include it with your message.